Establishing overall health level is key to disease prevention and optimized health. BioScan presents a systematic and convenient approach to calculating individual overall health. 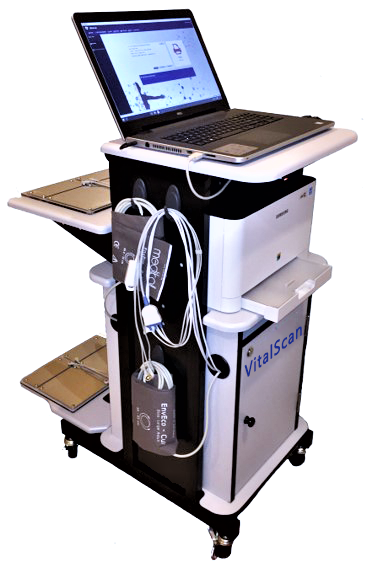 By combining the results of all BioScan procedural tests including the data collected from Pulse Wave Velocity assessment, ECG analysis, Autonomic Nervous System assessment, cumulative stress testing, fitness testing and correlation analysis a value for overall health is determined. BioScan analyzes the potential for health problems by examining the body of data generated by thorough testing as compared to a database of over 50,000 test subjects. The resulting value is measured in a percentage of overall health risk with 50% relating to 'normal'. A value of over 50% is cause for concern and necessitates medical intervention. The value can be useful in understanding current physical state as well as recognizing resource depletion and reserves available for coping with future ailments. BioScan products provide the depth and breadth of information required to make informed decisions regarding therapy, treatment and important lifestyle changes. Products are professional medical solutions suitable for mass testing in a cost-effective manner. The value of BioScan analyses and health testing cannot be overstated as preventative tools and supplementary guides to overall patient health. The assessment of non-specific health risk is a major tool of preventative medicine. Awareness of specific risks for individuals enables preemptive action, lifestyle changes, treatment initiation or adjustment and broad insight into current health conditions. BioScan Health Risk Assessment provides valuable information regarding the general health risk present at the time of testing. Health risks are particularly significant when high values are repeated (with small variances) after a second round of testing. A Health Risk percentage of above 50% is considered undesirable and cause for concern. In cases when similar values persist for periods longer than a few months, more detailed medical examinations and adequate interventional procedures should be initiated for improvement of health risk assessment results. Research indicates that individuals with high potential for health risks are more prone to develop disease, including serious, life-threatening conditions such as cancer, within the following few years of assessment. Determining overall health is, therefore, vitally important to the prevention of serious illness and an important contribution to the wellbeing and longevity of individual life. Patients are able to address their current health issues and manage risks accordingly in order to improve overall health. Prevention of disease is safer, easier and more economical than treatment. The value of BioScan analyses and health testing cannot be overstated as tools of prevention and supplementary guides to overall patient health. The multidisciplinary Health Risk Assessment helps to achieve supplementary clinical guidance and important information for achieving and maintain an optimal lifestyle.